Do you need to recharge those batteries far away from the maddening crowd where you can have peace and tranquillity, are you a beach babe or a water sport enthusiast or maybe even a bird watcher; Pomene ticks all the boxes together with the added bonus of accommodation on the water’s edge and an amazing restaurant serving delicious food. 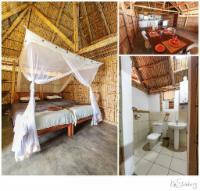 Paradise Beach Lodge lies 650km north of Maputo between Inhambane and Vilanculos on a stretch of Indian Ocean coastline that is unspoilt and pristine called Pomene (North Bank). Pomene Bay and Estuary are home to a wealth of sea life, seahorses and starfish that appear when snorkelling, hundreds of pansy shells and flamingos that roam free. Pomene is one destination that caters for all facets of fishing and ticks all the boxes for a fun filled family and water sport destination with ever changing views with the tide that moves in and out. Our units consist of rustic appointed thatched lodges embracing local materials while still offering elegance and simplicity with ample room between the units to ensure clients have privacy. The units are only 20 meters away from the water at high tide and around 30 meters at low tide, offering ever changing and spectacular views - no day dawns the same. We have 4, 6 and 8 sleeper units which are fully equipped, all you need are your own beach towels and beach chairs. All units are serviced and our staff will take care of all your washing, cleaning and assist to make your stay as comfortable and relaxed as possible. A full Restaurant and Bar set on the edge of the water serves all meals together with awesome cocktails, guests can enjoy a snack lunch while the children frolic in the water or a romantic seafood dinner while the water lapse against the edge of the deck at high tide. Not to disappoint our sports enthusiasts, full DSTV is available while sipping an R and R or an ice cold 2m. Our baker will ensure guests get the best hot pão delivered each morning in true Mozambican style. Paradise Beach Lodge is a must for water sport enthusiasts, be it wind surfing or kayaking, snorkelling or kite surfing and is one of those fishing destinations where both facets can be focussed on – conventional rock and surf, and power angling with artificial baits both producing incredible catches. Top anglers will have their skills and there tackle tested so you have to be prepared. Should you bring your own Boat or Jet Ski they are launched the day you arrive and only need to be taken out the day you leave being safely moored in front of your unit. 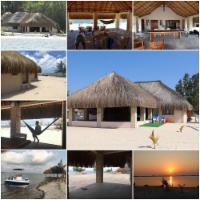 The lodge can arrange deep-sea charters, snorkelling and estuary cruises subject to availability. To reach the lodge you do need either a 4x4 if towing or a minimum of a 4x2 with difflock and adequate ground clearance if not towing. Beach: Pomene is surrounded by miles of white sandy beaches where cowries are still picked up, pansy shells are plentiful and flamingos roam free. Water that is crystal clear and the elusive seahorses and star fish appear when snorkeling. .
Family friendly: Families can enjoy quality time with the focus being on the safety for children in the estuary while parents can enjoy themselves on the deck while the kids frolic in the water. Romantic: With the miles of unexplored beaches most times you have the beach to yourself, romantic dinners are had at the restaurant while the water lapse around the edges at high tide and the full moon reflects against the water. Our stay was Awesome. Thank you to France and Johan and all the staff that made it so much fun for us. Will definitely be back. Regards Angeline. Very nice, friendly, warm people. The Stay was great will definitely go back again. Fantastic view. Great hospitality. Great food. Best bread loafs baked daily. Thank you. We had a phenomenal time at Paradise Beach Lodge with France and Carol. The accommodation was neat, clean and well serviced with spectacular views of the tidal lagoon and literally on the sea. The pub had ice cold beer and lovely fare with great company. We highly recommend staying here. The lodge is as described, we enjoyed our stay there, the staff is fantastic and the management is caring, for someone that wants to chill, this is the place to go!Thanks Carol and France, we enjoyed our stay at your venue! This is the best eco tourist destination. The friendliness and service of both owners and staff was outstanding; the chalets rustic but clean and well appointed; the environment is peaceful, pristine, safe and unspoilt. The restaurant was always available despite the distance from shops. The 4x4 track to get there is very easy for a 4x4 and not as dauting as expected. It was the best possible quiet and relaxing holiday. We were really spoilt. 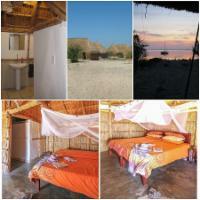 Paradise Beach Lodge Pomene is 9.8km from the centre of Pomene Bay , the nearest airport 97.4km (Vilankulo Airport).